Hever Castle is located in the centre of the village of Hever. It began as a country house, built in the 13th century. From 1462 to 1539 it was the seat of the Boleyn, originally ‘Bullen’, family. Anne Boleyn, the second queen consort of King Henry VIII of England, spent her early youth there, after her father, Thomas Boleyn had inherited it in 1505. He had been born there in 1477, and the castle passed to him upon the death of his father, Sir William Boleyn. It later came into the possession of King Henry’s fourth wife, Anne of Cleves. Today it is a popular tourist attraction. Their website is www.hevercastle.co.uk. There have been three main periods in the construction of this historic castle. The oldest part of the castle dates to 1270 and consisted of the gatehouse and a walled bailey. The second period was when the castle, then in need of repair, was converted into a manor in 1462 by Geoffrey Boleyn. He added a Tudor dwelling within the walls. The third period of repair and renovation was in the 20th century when it was acquired by William Waldorf Astor. Geoffrey’s grandson, Thomas Boleyn, inherited the castle in 1505. He lived there with his wife Lady Elizabeth Howard and their children George, Mary and Anne (the future wife of Henry VIII). 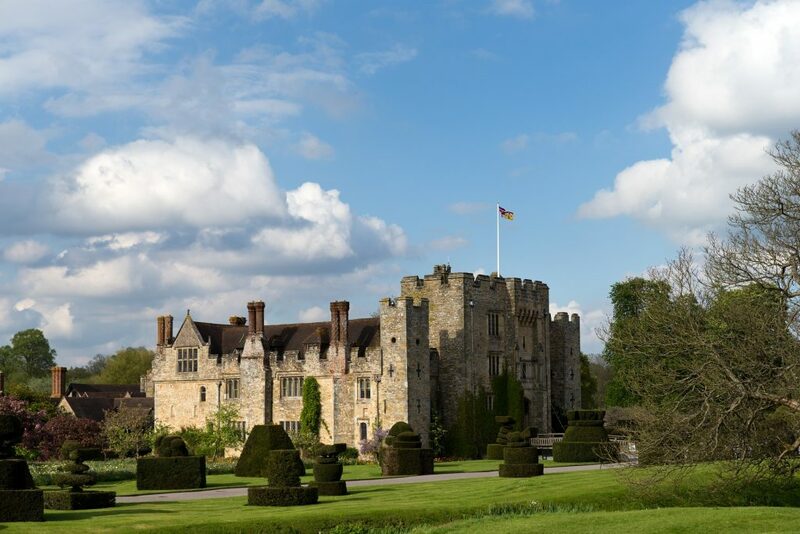 It is not known if Anne was born at Hever (the year of her birth is not known for certain) but she lived there until she was sent to the Netherlands in 1513 to receive an education at the court of the Archduchess Margaret. The property came into the possession of Henry VIII after the death of Anne’s father, Thomas Boleyn, in 1539. He bestowed it upon Anne of Cleves in 1540 as part of the settlement following the annulment of their marriage. Hever Castle still has one of Henry’s private locks, taken with him on his various visits to noblemen’s houses and fitted to every door for his security. The building subsequently passed through various owners, including the Waldegrave family in 1557 and the Meade Waldo family from 1749 to 1903. During this latter period of ownership the castle fell into a poor state of repair, during which time it was leased to various private tenants. In 1903 it was acquired and restored by the American millionaire William Waldorf Astor, who used it as a family residence. Since 1983 the castle has been owned by Broadland Properties Limited. The estate is now run as a conference centre, but the castle is open to the public and is particularly well known for its mazes. The only original part of Hever Castle is the gatehouse. In the castle there are exhibits from differing historical eras, including instruments of torture and a museum of the Kent Yeomanry. The remains of the original country house timbers can still be seen within the stone walls of the fortification. Today the castle is popular with visitors, attracting large crowds of all ages. The castle has lots to see with three floors to look at with antique furniture, Anne Boleyn’s prayer books and a large collection of Tudor paintings. It has an yearly events program with assorted events including Jousting tournaments & Archery displays in the Summer months and the annual Patchwork & Quilting exhibition in September. Most visitors are drawn to the fascinating castle history, elegant gardens, and boating lake. There is a yew maze, planted in 1904, as well as a more recent addition, a water maze, which opened in 1999 the object of which is to get to the centre folly without getting wet. There is also a Tower maze for children in the adventure playground (the secret is to know the order of Henry VIII’s wives.) The garden has a wide range of features including an Italianate garden, rose gardens, herb garden, interesting topiary shapes and the beautiful lake. In the same building as the Hever shop is the ‘Castles to Country Houses’ exhibition which is a collection of 1/12 scale model houses from Medieval to Victorian made by master miniaturist John Hodgeson. 2010 saw the revamping of the larger of the two restaurants in the grounds (the Guthrie Pavilion by the lake) and the launch of the iphone app which gives a guided tour of the Castle.